Clean the proposed surface areas thoroughly. This is the single most important step of the Metro Process. Our professional surface technicians use the most updated cleaning equipment to prepare your paved surfaces. 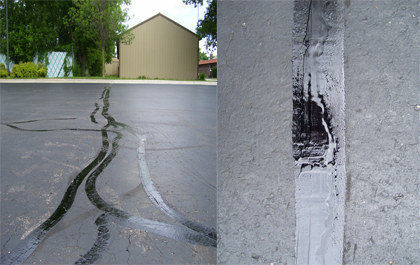 Our professional service technicians will next apply our custom blended Metro Sealcoat asphalt sealant to your paved surfaces. Our professional equipment will provide an expert and thorough coating. Cracks and open paving joints allow water to enter below the surface of the pavement. This can result in erosion of the subbase and create significant problems during the freeze/thaw conditions of winter months ... the leading cause of pavement distress. we will reapply all pre-existing pavement markings or redesign your layout to maximize parking and traffic flow, all with professional marking products meeting State and Federal specifications. Installation of custom and standard traffic signs, handicap signage, etc. Metro Sealcoat will remove and replace all deteriorated blocks, bricks and mortar, re-level the existing grate and replace the failed surrounding asphalt, giving you a structurally sound catch basin. New hot asphalt placed directly over the existing asphalt, and then compacted.